Matt’s Roofing and Gutters is proud to offer a full range of custom services for professional roofing in the Atlanta area. 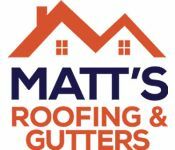 Matt’s Roofing and Gutters is a locally owned and operated roofing company serving the Atlanta area since 2007. Our licensed roofing contractors are proud to offer you the best roofing services available, and take care of all project details, from no-cost initial consultations to thorough site cleanup after the job is done. Your home and your family will be in good hands during the entire process. We are the local roofer you can trust! Why Choose Our Professional Team? Deciding whether to renovate or replace your roof can be challenging and stressful. At Matt’s Roofing and Gutters, we specialize in making the process as easy as possible. As an expert licensed roofing contractor, our company has extensive experience with a wide variety of roof renovations, gutter repairs, and window repairs. Our perfect BBB (Better Business Bureau) scores and thousands of satisfied customers all testify to our strong work ethic and customer-focused service. At Matt’s Roofing and Gutters, customers are truly our number one priority. Our licensed contractors are committed to providing excellent customer service and quality craftsmanship. Our values, thoroughness, and integrity are a refreshing step above the standard level of care other companies may provide. Our mission is to provide the highest quality of service and trustworthiness to every customer we serve. Our staff is ready and available to partner with our customers throughout the duration of the project and beyond. Matt’s Roofing and Gutters is fully certified as a GAF Master Elite Contractor, giving you a guaranteed high level of quality in all our products and services. We were named “Best Pick for South Atlanta” in the 2012 issue of Home Reports and our BBB (Better Business Bureau) score is 100% with no complaints of any kind. When you hire us to work on your roof and gutter repair or replacement projects, you are entrusting the safety of your home and family to the best professionals in the area.